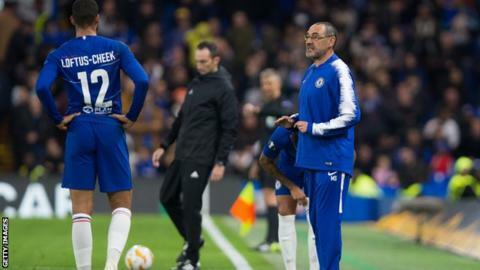 Chelsea manager Maurizio Sarri admits he has a "tactical problem" and is struggling to fit Ruben Loftus-Cheek into the side despite the midfielder scoring a hat-trick in Thursday's Europa League win over Bate Borisov. The England man has started only two games for Chelsea this season. The 22-year-old is below four other midfielders in the pecking order. As well as Kante, Sarri has often used summer signings Jorginho and Mateo Kovacic in midfield, as well as England's Ross Barkley. Loftus-Cheek spent last season on loan at Crystal Palace and was impressive, scoring twice and assisting five times in 25 appearances. His form earned him a call-up to England's senior squad in November 2017 and manager Gareth Southgate said he was "capable of anything" after his man-of-the-match debut performance against Germany. But since progressing from Chelsea's academy in 2014, the midfielder has made just 35 appearances in all competitions for the first team. His most successful season was in 2015-16, when he was given 404 minutes in the Premier League - already less than what Kovacic, Jorginho and Kante have achieved this season in just nine matches. However, following impressive performances against Vidi and Bate Borisov in the Europa League, Loftus-Cheek is pushing for a start in the Premier League and his chance could come this Sunday against Burnley. Sarri says he will "need to change six or seven players" for that game, though Jorginho, Kante and Kovacic were all rested for the win over Bate Borisov. After picking up the first hat-trick of his career, Loftus-Cheek is full of confidence and admitted "it was a nice feeling" when he was congratulated by his team-mates. "It feels really good. I walked into the dressing room and the players gave me a round of applause and a cheer," said Loftus-Cheek.